America has experienced a food truck revolution over the past four years. Mobile kitchens have become a popular business to venture into, especially if your end goal is to open up a restaurant. We spoke with Christina Brunet-Sabastia, who along with her husband Milan, owns Mimi’s Bistro on the Go a roving food truck serving the Pensacola, Florida area. However, unlike most food truck operators, this isn’t their day job. Christina is a news anchor/reporter for the local ABC affiliate and Milan is an insurance agent at State Farm. Here’s the story of their double lives as mobile restauranteurs. Why did you decide to go into the food truck business? My husband is French and was moving to the United States, and he didn’t have a job yet so we were looking into opportunities where we could be our own bosses and try something different. In France, crepes are obviously very popular - There’s always a line for them! And personally I’m obsessed with them, so we had the idea to start a French crepe food truck. What attracted us to a food truck was the fact that it required much lower capital than opening an actual restaurant, which would have been impossible for us. We also liked the idea of being able to move around. With my job in the news business, I never really know where I could end up, so a mobile business seemed like a really good idea. A food truck just seemed more doable; a restaurant was a little too intimidating. What should someone consider before entering into this industry? The regulations. Even if your city has a certain type of regulation at the time you go into business, they can change at any moment. So, you always need to have a Plan B. If you aren’t someone who is flexible and can figure out alternatives, this probably isn’t the business for you. If you have any sort of aptitude for being handy or fixing things, that is also really useful, because you are taking something that is not traditionally used as a restaurant and turning it into a restaurant. Things break all the time and fixing them is an expense that is hard to handle when you are first going into business. I wish I’d known how important these two things would be when we were just starting out. There’s so much you don’t know and you will need to figure it out along the way! How would you recommend someone who is interested in this industry prepare for it? I recommend talking to someone who owns a food truck. In my case, I knew someone who had a restaurant and a food truck, so I spent some time with him and really grilled him about everything to do with his business, from paperwork to menus to graphics to marketing. I also read The Food Truck Handbook, which I found invaluable because it explains how to get financing and explores the different ideas and how trucks are implementing them in cities all over the country. Another thing I did was listen to podcasts on food trucks. I started to do this more after we opened, and I really wished I’d done more of this beforehand. You hear stories from people who may have a $200,000 truck, come from the restaurant industry and obviously know way more about this business than I did, yet you are experiencing the same problems. Neither you nor your husband had a culinary background, so how did you get up to speed on the food part of the business? That was certainly interesting. Milan trained in a creperie in France which really helped him learn all about the process of making crepes. It’s mandatory to take a sanitation course here in Florida, so we learned a lot from that. I really tried to learn anything I could from any available source. Unfortunately, the best teacher was experience. How have you had to adapt your business to meet the needs of the community over the 1.5 years you have been in business? We are constantly making changes to our business plan. We started out operating Tuesday through Saturday in a downtown Pensacola location. A few local restaurant owners weren’t happy about it and were actually pretty mean to us. That’s just not the environment we wanted to be in. We had some strong political persuasion to stop operating downtown. At that point, we weren’t doing really well there anyway, so we decided to try out an Antique Mall in a different area of town where we were welcomed. Business started booming again because we had exposure to a new audience, but we realized that we made most of our money at city events like festivals and private catering gigs. So, we decided to work smarter, not harder and just do events and catering. For us, that business model is more profitable and more manageable. 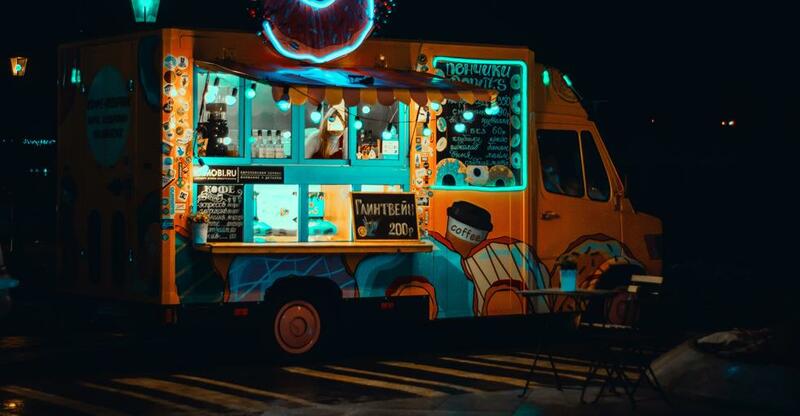 What kind of skills do you need to run a successful food truck ? I think you need strong business and organization skills more than anything, as well as a willingness to not give up. You also need to be willing to go with the flow and change your business model, if needed. You need to be able to understand and cater to what your customers want. If you can cook and you are passionate about it, that just makes the job more fun for you. We had hardly any kitchen or food experience and we’re still in business, a year and a half later. How have you marketed your business? Social media is absolutely huge, so use that to your advantage. 100% of our marketing has been through social media and word of mouth. We’ve found success with offering promotions for our customers such as $1 off their order if they post about their experience on Facebook or Instagram. What are your tips for thriving in this industry? Make great relationships with your customers and your vendors. Since we do a lot of events it’s important for us to submit paperwork and payment in on time so that we are invited back. Remember, that the customer always come first. Make a trip to your truck an experience for them versus just selling them food. Whatever type of food you serve, dress the part and have fun. Good customer service goes a long way. Don’t be afraid to reach out to other food truck owners for advice and guidance. Most food truck owners would probably have a conversation if someone reached out with questions about starting their own business. Find them on Twitter. We are friendly people! Remember that it is not easy. I lot of people tell me “You are living the dream. Owning a food truck with your husband must be so awesome.” It is, but it’s also a labor of love, so you really need to go in knowing that. Don’t expect it to be easy, because it won’t be. What are your long-term goals for the business? For now, we are happy where the business is now. We’ve discussed expanding or possibly operating during the week again, but we really love our full-time jobs so we’d need to bring someone in if we wanted to do that. Why should someone start a food truck before opening a restaurant? Absolutely. It’s a great idea to get your feet wet and get some experience before you take that plunge. We were thinking of opening a restaurant at one point when we first started. Now that we’ve been doing it for a while, we realize that’s not for us, but it’s a great way to get into the industry to see if you like it. What do you love the most about owning your food truck? I love being my own boss. I love meeting all sorts of cool people. I love the carnie family we have developed and how incredibly helpful and non-competitive they are, which is so different from the restaurant industry. It really helped us get through that first year and develop a system for our business. After that first year, you can really start to be creative. I don’t have a baby, but I think it’s the equivalent of having a baby. There are so many new things that you don’t know and you are trying to figure it out. You feel like you are always behind, but after you get through that first year, you feel like you finally have a grasp on it.